It’s that wonderful time of year when New Englanders start dreaming about warm summer days and driving around the coast with the windows down. But before you can load up the car and take a leisurely Sunday drive, you should take time to do some major cleaning and detailing to wash away everything that winter left behind. Snow, ice, slush, mud, muck, and all those de-icing salts and chemicals can wreak havoc on your car’s exterior. Plus, there’s everything that gets tracked inside your car as passengers rush in to get out of the cold. 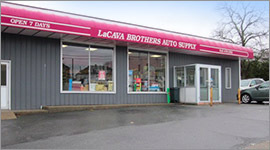 Stop by LaCava Brothers Auto Supply for all of your tools, accessories, and car cleaning supplies in Fall River. The first step is to get rid of all the dust, dirt, and trash that has accumulated inside your vehicle. You can use a home, cordless, or shop vacuum to get in there and clean or take your car down to the local car wash to give it a good clean-out. Use a microfiber cloth to get all of the dust and particles off of the dashboard and console, as well as all the nooks and crannies throughout your vehicle. You can also use an air spray can and Q-tips to really get in there and get the gunk out once and for all. The next step is to wash the carpets. Remove the car mats from your vehicle and use a foaming carpet spray from your local auto supply in Fall River to scrub your carpets until they are clean. You can use a microfiber cloth to remove any residual foam. Finish the process by vacuuming the carpet again to make sure everything is gone. The windows will need to be cleaned both inside and out. Use a glass cleaner and a glass-specific microfiber cloth for this job. A lot of people recommend newsprint for this or paper towels, but you will get the best results from using a specialized microfiber cloth. Clean the inside as well to remove any film that has formed during the winter months. If you discover any cracks or pitting in your windows, which can happen if you got caught following a snow plow or a big rig on the highway, make sure to take care of it right away. While many cracks require replacement, some can be repaired using a glass repair kit that you’ll find at your local Fall River auto parts store. If your vehicle has vinyl or leather seating, either in whole or in part, make sure to provide care for these materials as well. Use an all-purpose vehicle cleaner, a small and soft brush, a microfiber cloth, and an all-purpose scrub pad for this project. Look for cleaning solutions and moisturizing protective products made specifically for your type of seats. These should be included in your car cleaning supplies in Fall River and the surrounding area. Vinyl and leather cleaning products should also be used for cleaning the dash, console, and other hard surfaces within your vehicle. Don’t just clean the leather and vinyl in your car or truck. Make sure to extend the life and luster by using a moisturizing or protecting product. These treatments can also prevent stains from forming after spills and improve the look of your interior. LaCava Brothers Auto Supply has a wide variety of protective products that can be used with other cleaning products at our Fall River auto parts store. Another area that can get really dirty and lead to damage is your wheels. They can be difficult to clean unless you have the right tools, products, and techniques. While there are many different types of wheel cleaner available at LaCava Auto Parts, many detailers swear by acid-free, water-based solutions for best results. You don’t want to use anything that might damage your wheels. Follow the directions on the product, allowing the cleaner to work before brushing it to remove dirt and grime. A second application can be used, especially if your wheels are particularly dirty at the end of winter. Dry your wheels with a microfiber cloth. Consider using a wheel treatment product to protect your wheels from damage caused by UV-rays in the spring and summer months. For wheels that are particularly dirty, you can use paint clay to remove anything that lingers. For best results, spray a lubricating spray wax to the surface of your wheels before using the clay to assist in removal of contaminants and debris. Check the integrity of your tires to make sure that they are in good condition before any road trip. Make sure that there is enough tread to safely take your trip without incurring issues with your tires due to excessive wear. We carry a wide range of car cleaning supplies and tools at our Fall River auto parts store. Give us a call at 508-676-1951 or stop by our location on Bedford Street. LaCava Auto Parts can help you find the products, parts, tools, accessories, and extras you need to keep your vehicle in good looking and working shape year-round.